Kids love Valentine's Day! 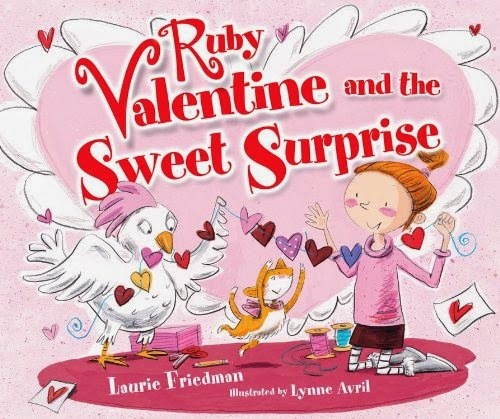 This collection of Books About Valentine's Day is all about hearts, love, sweeties, and friendship. We found some new favorites, and hope that you do, too! This cute story goes to the tune of "Oh My Darling, Clementine" and is very funny! A man tries several ways to deliver a Valentine to his sweetheart but something goes wrong each time. The illustrations are very clever, with tiny little details that help the story make sense. This book is suitable for older toddlers, preschoolers, and elementary aged children. The lady's hair is something to behold! This book is part of a series about different holidays and other important days in the lives of children. They're all set to the rhyme of 'Twas the Night Before Christmas. 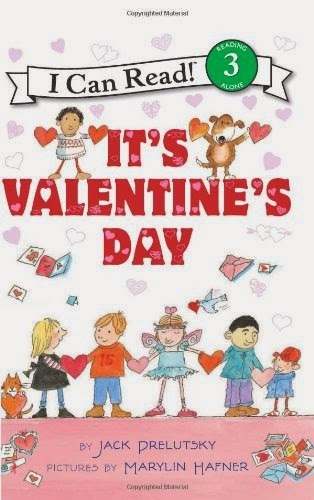 This book is pretty clever, as boys and girls make Valentine's for their classmates. Your preschooler or elementary aged child will love it! 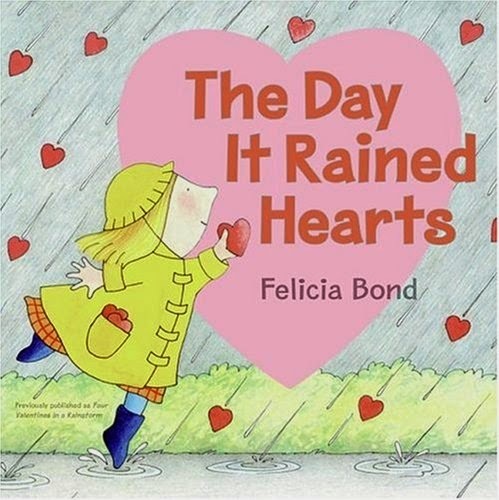 The Day It Rained Hearts is my favorite Valentine's Day book! Cornelia Augusta collects hearts of different shapes and sizes as they rain from the sky one day. Then she makes Valentines for her friends, each perfectly suited for them! You'll recognize the illustrations by Felicia Bond-- she also illustrated the If You Give A Mouse a Cookie books. We read this over and over again, even when it's not near Valentine's Day! 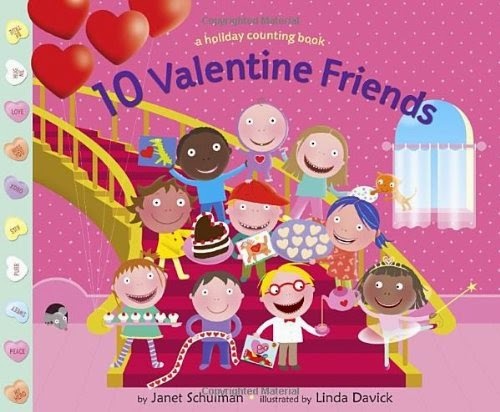 A group of friends makes Valentines for one another in this counting book. The illustrations are quite cartoonish, but all in all this is a good choice for toddlers. The book is written in simple rhymes that will make your little one giggle. 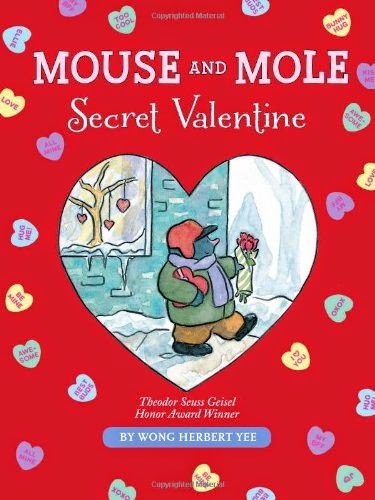 I wasn't familiar with this series before reading this book, but I'll probably check out a few of the other "Mouse and Mole" books. The characters, Mouse and Mole, and their friends are reminiscent of the famous Frog and Toad. This is basically a very early chapter book-- an older, mature preschooler or elementary student could listen to it in one sitting, but younger children would still enjoy the story in several doses. Mouse and Mole like one another, and send Valentines to one another. The illustrations are crisp and simple, but are still able to convey the sweet emotions of the story. Splat is one of our favorite cats. 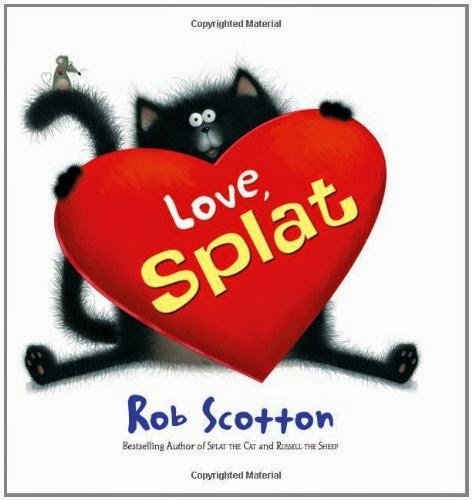 Love, Splat perfectly conveys the angst and drama of young childhood love! Splat is sweet on Kitten, who teases him, but the two eventually realize that they like one another. I recommend this book for preschoolers and elementary aged children. Young Ruby Valentine gets a new pet, which makes her old pet feel jealous. Eventually they all realize that there is plenty of room in Ruby's heart for them both. This story could teach children a valuable lesson about the capacity of their parents' love, especially if there are any issues of jealousy present. I recommend this book for preschoolers and elementary aged children. The illustrations are bright, and colorful, and appeal to children. 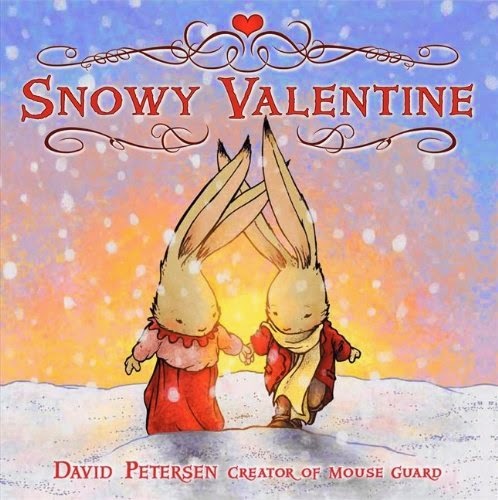 This book was my favorite one of the week, because I thought it captures the true meaning of Valentine's Day, and has stunning illustrations. A bunny sets out to find the perfect gift for his wife. Nothing will do, but he eventually realizes that his tracks in the snow have made a heart for her to see. She's happy with a simple gesture, and he's incredibly thoughtful in his deliberations about a gift. This book was surprisingly sophisticated for a children's book, but still completely accessible to little ones. This is such a cute story, and unlike any of the others that we read this week! 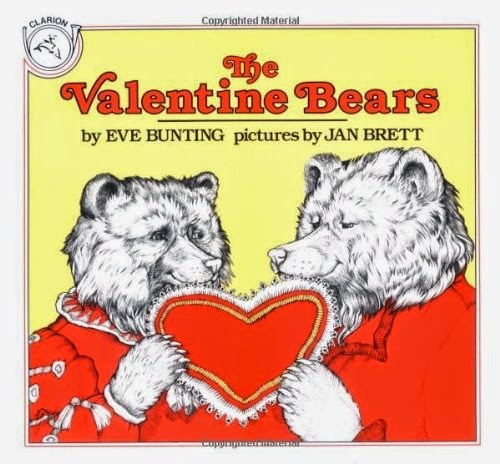 Mr. and Mrs. Bear are typically hibernating right through Valentine's Day, but one year they set an alarm for February 14 so that they can celebrate together. You'll recognize the illustrator, Jan Brett, who is probably most well known for The Mitten. This book also provides a great opportunity to talk about how animals hibernate! 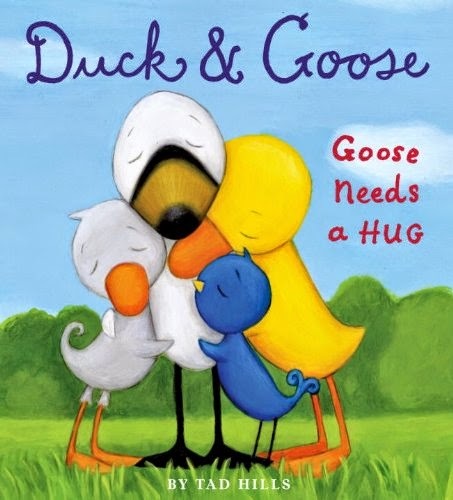 While not specifically a Valentine's Day book, Duck and Goose, Goose Needs a Hug is so sweet that I had to include it. Goose needs a hug, and his eager friends keep trying to cheer him up before he can tell them what it is that he actually wants. His friends sure do love him, and it shows in this cute story of friendship. 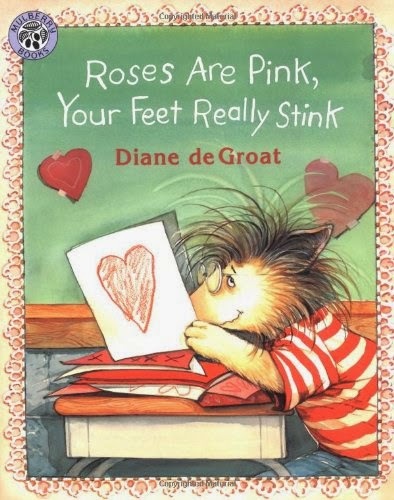 When Gilbert writes two not-so-nice Valentines for his classmates, plenty of light hearted trouble ensues. All turns out well in the end, but Gilbert learns his lesson about how hurtful words can be. This book would be a good choice for older preschoolers or elementary children. If you're not familiar with Jack Prelutsky, then I suggest you add him to your next library list! He writes simple (and often hilarious) poems for children-- sort of like Shel Silverstein, but much less wacky. 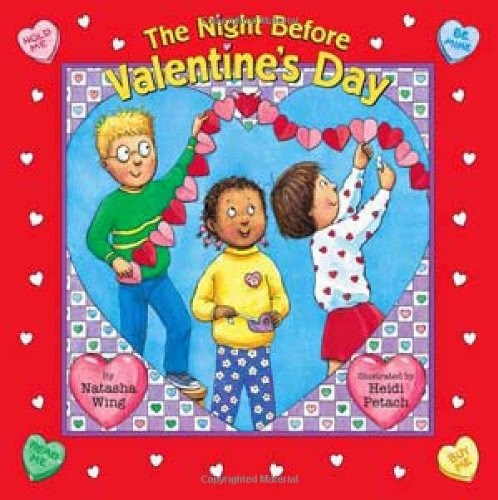 This is a cute collection of Valentine themed poems. Some are sweet, some are funny, but all are entertaining. The illustrations are perfectly complementary, as well. I recommend this for children of all ages! I adored this book! There aren't many words, but instead the book primarily relies on the illustrations to tell the story. 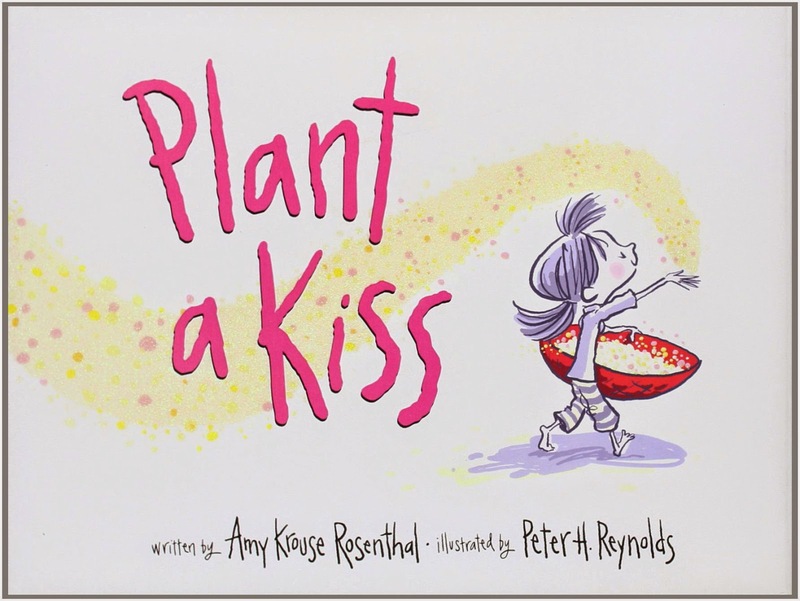 A little girl plants a kiss. Love starts to grow, and when she spreads it around, she ends up with even more than she started with! What a great lesson for our kids! Your older toddler, preschooler, or elementary child will like this story (and the sparkly glitter on the pages). Here's one for the youngest listeners! This book is traditional Karen Katz, with her distinctive illustrative style and simple flaps for children to lift. 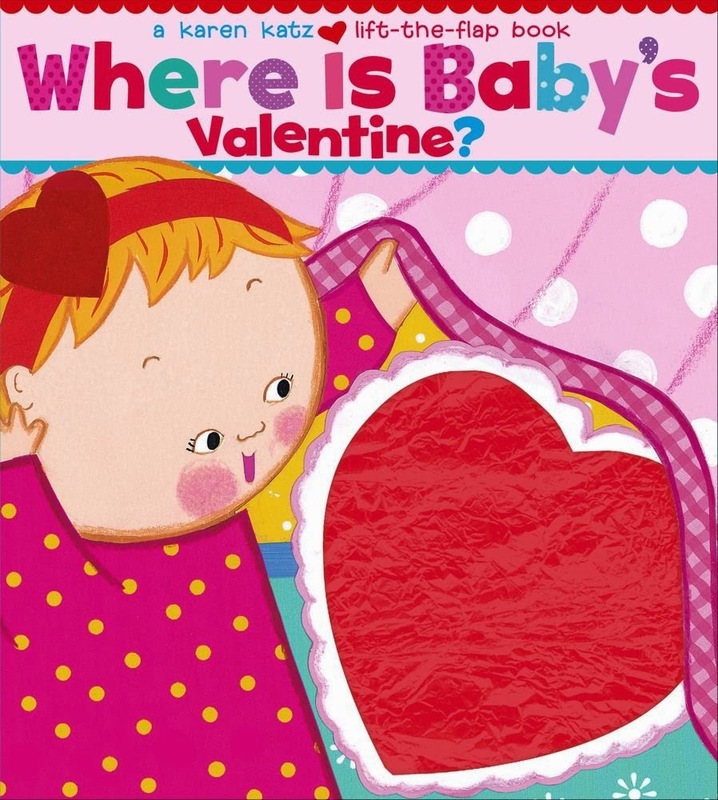 Baby looks around the house for her Valentine, but instead finds balloons, a teddy bear, and flowers. 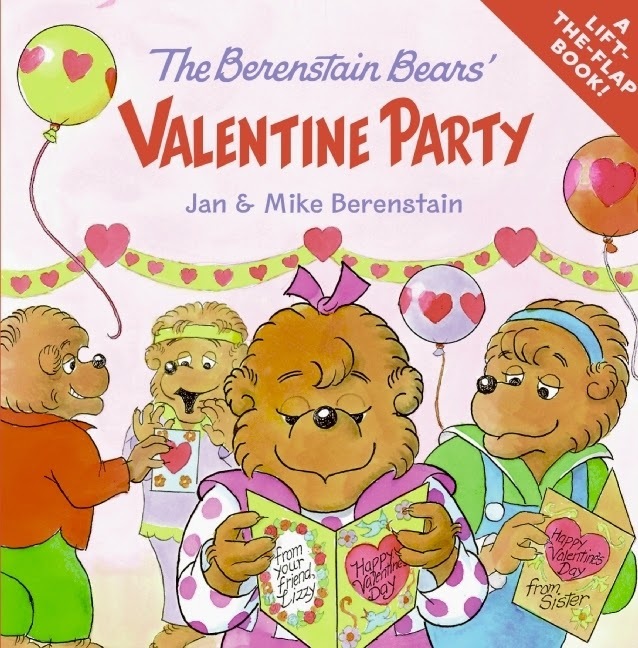 This installment of the Berenstain Bears is a much shorter, simpler story than most. It is designed to appeal to a younger crowd, with flaps that kids can lift to find things around Sister's classroom. 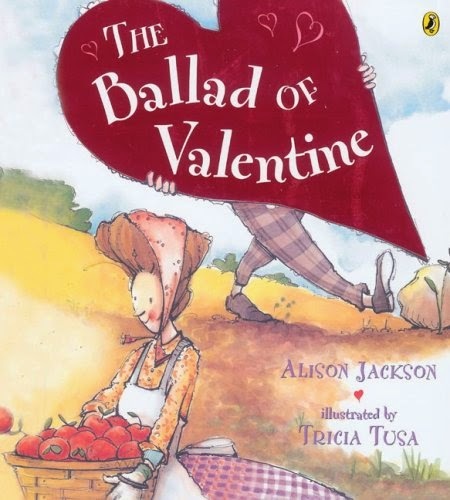 It also features several cute Valentine rhymes (and a couple that are not so sweet, which I could have done without). Your older babies, toddlers, and preschoolers will like this book. 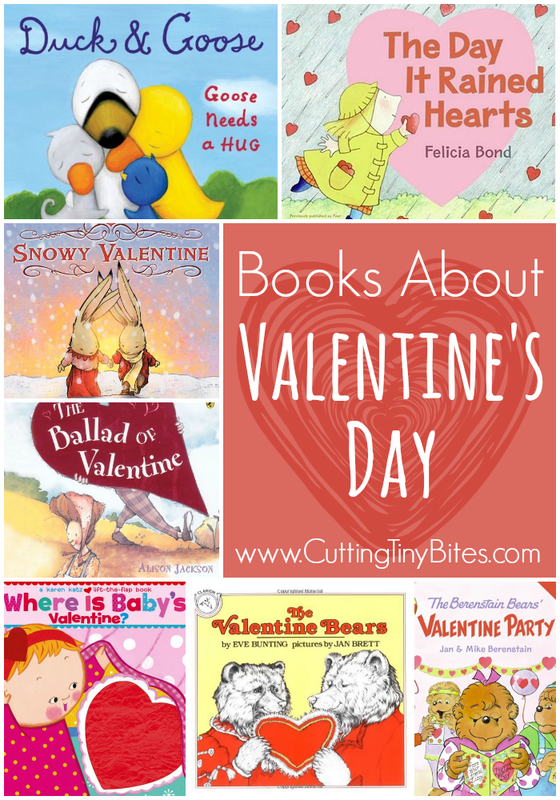 List of children's books about Valentine's Day. Reviews of each. Choices for babies, toddlers, preschoolers, kindergartners, and elementary children.